3 scoops Vanilla Prograde Protein Powder. 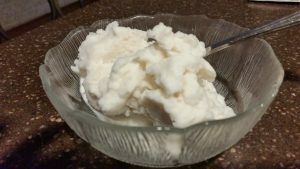 Combine Coconut Milk, Protein Powder, Vodka and Stevia with a beater or immersion blender until protein is thoroughly incorporated with no clumps. Makes 3 cups ice cream.